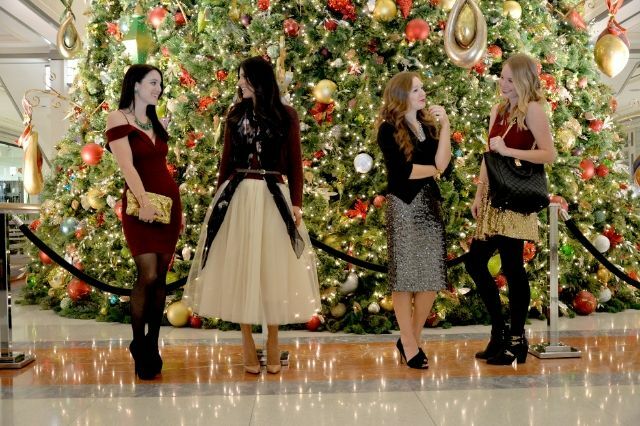 It's that time of year where we will all be attending holiday parties as well as getting our NYE outfits ready. I don't know about you, but I like to know what I'm wearing far in advance when it comes to dressier looks. As a mother or two, it's hard enough to get everyone ready and out the door on time let alone trying to figure out what everyone is wearing the day of. I mean, do you want to be stressed out?! Just plan ahead of time and save the headache! 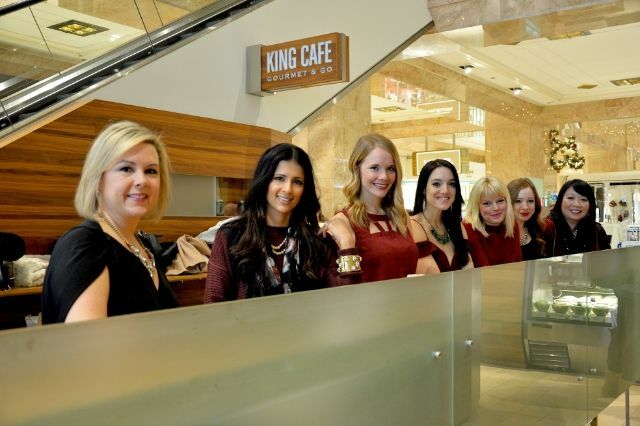 Embracing the two concepts of sequins and the color oxblood, seven Chicago bloggers got together to show you our idea of holiday style. We wanted to show a wide range of styles to fit whatever party or event you are attending in the next month or two. 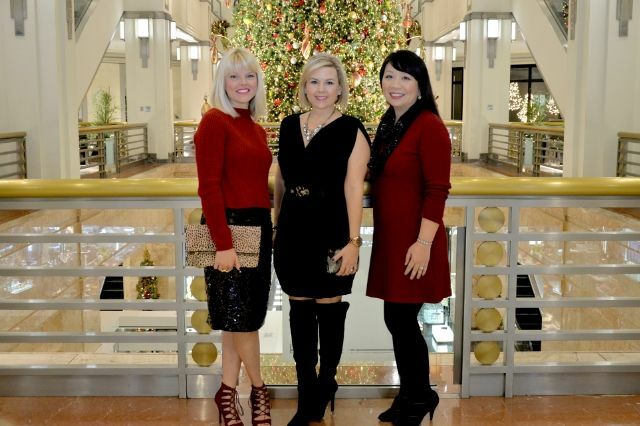 We met downtown at the 900 North Michigan shops and starting having a fun photo shoot sponsored by two of my favorite online shops, Lulus & Shop Lately. 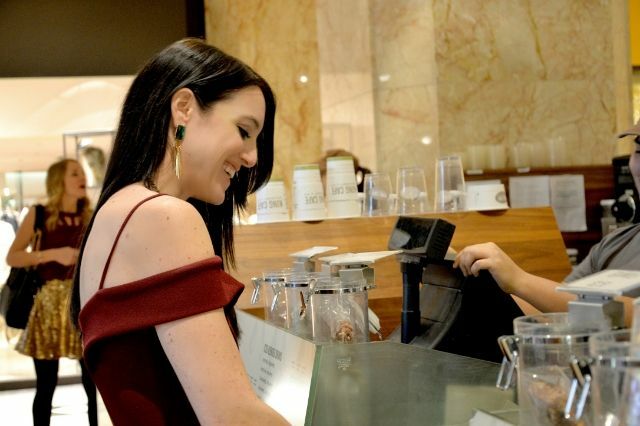 Lulus: "Since its inception in 1996, LuLu*s has grown from a mother-daughter dream to one of the web's most outstanding shopping experiences. We offer a select choice of clothing, shoes and accessories. Our brands consist of emerging new designers and our buyers travel the world so that you can find a style to call your own. We buy in limited quantities as many of our items come fresh from our designers' studios." Shop Lately: A marketplace, giving designers and brands the opportunities to showcase their products.You can find clothing, accessories, shoes, and even beauty products on Shop Lately. There are new arrivals events every Monday and awesome sales events every Wednesday! Insider Program: For only $9.00 per year you can get free shipping on all orders. Sign up for that here. The Christmas tree at the 900 North building is amazing. It's pretty much the most beautiful thing ever and I have been lucky enough to see it every year for the past five years now. It's not really a tradition as I have somehow ended up there each year for blogging events or shopping. Either way, I love the tree and I loved getting photos taken in front of it. I think it's so fun to see how everyone has a different style yet we are all wearing the same "theme" if you will. I'm telling you all now, after seeing Zahra, I need a tutu in my life! For my outfit, I went with more of a NYE look. This oxblood dress is a stunner for sure. You can't help but feel hum-a-la hum-a-la boom-ski in it as it's a bodycon that gives a little extra in the shoulder and the neck line. We stopped for a mid-photo shoot coffee at King Cafe (I got a green tea latte) and decided to take a few shots of us in action. All the looks wear so wearable and comfortable to be walking around and sitting in. It kind of felt like we were on a mini holiday party ourselves! I love all the outfits the girls styled. I now want to shop for a tutu, and a sequin skirt, and those oxblood heels, and more jewelry now, but hey, I have a lot of parties to attend to so why not stock up before the items sell out? 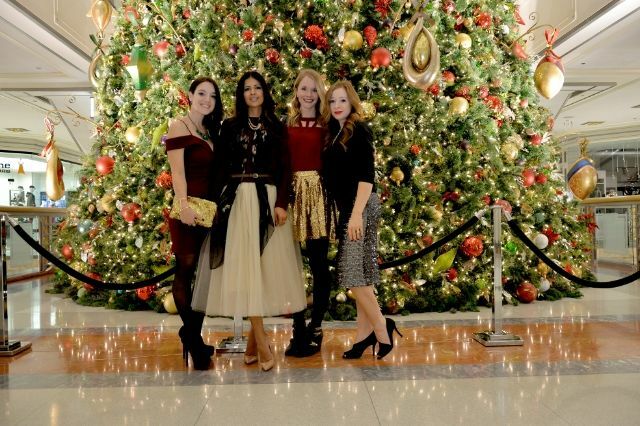 What do you plan to wear to your holiday parties or events this year? Do you have your NYE outfit picked out yet? 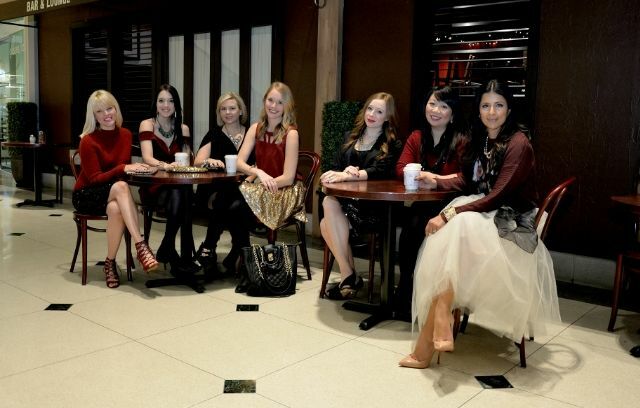 * All of the Shop Lately items that all seven bloggers are wearing are currently on sale! Get them while you can, there are limited numbers and they sell out fast.